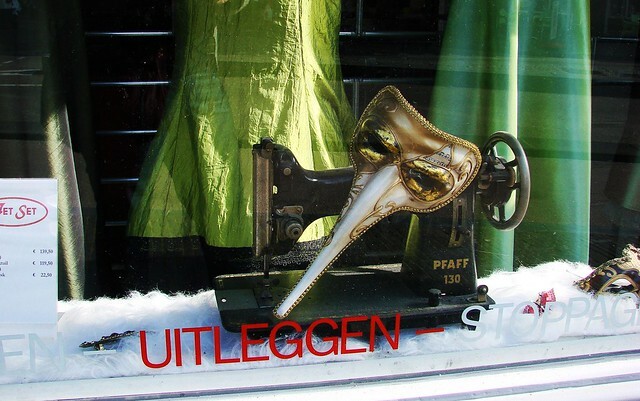 As I mentioned in my last post, Utrecht’s former red-light street — Hardebollenstraat — is now the place to find lots of local and indie shops selling clothing, designs pieces, and much more. The large windows that were de rigeur for the previous tenants have remained in some cases and been redesigned in others. Each shop is putting their own stamp on the street. 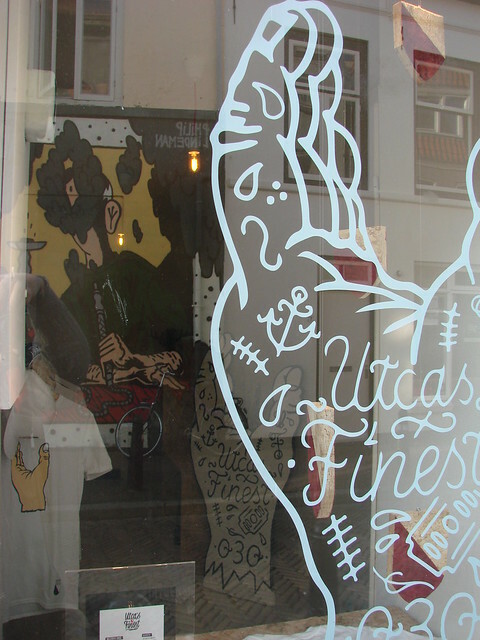 Utca’s Finest is one of the new shops that has found a home in this revamped street. 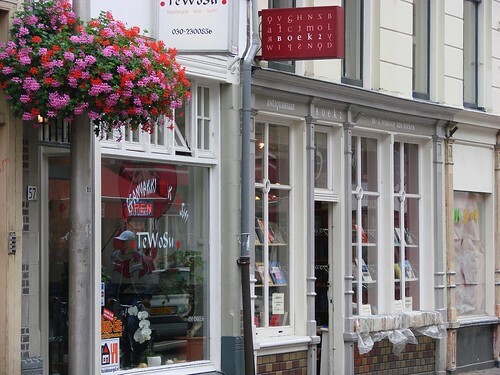 It has been around for a few years now, first as a webshop primarily and then in other locations and pop-ups around town. 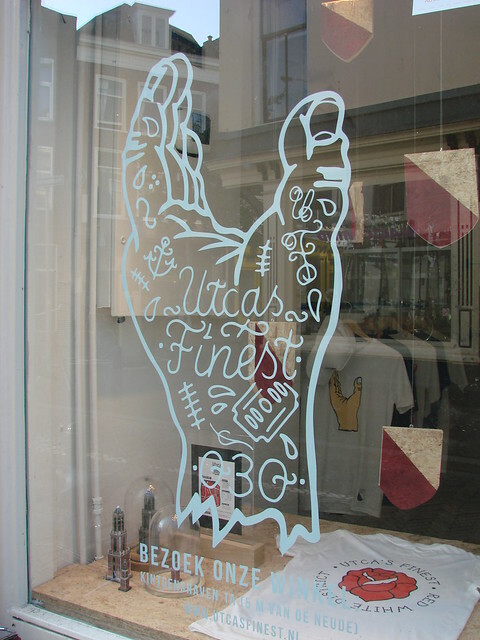 They are known for their various types of clothing that all promote Utrecht in a cool, urban, graphic style. Think hip hop, skateboarding, and tattoos. 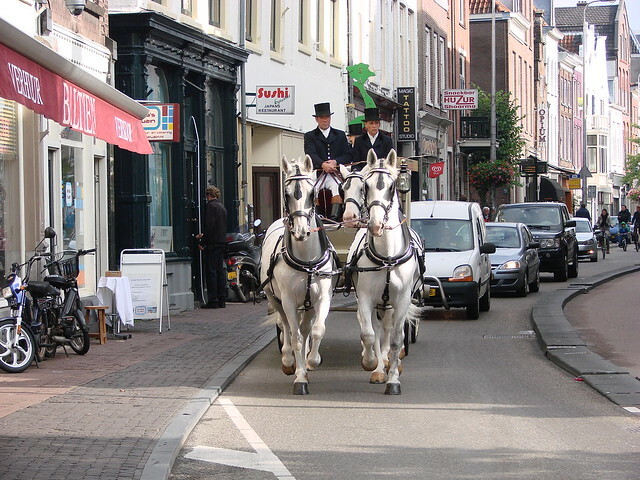 Utca’s Finest is voor Utrecht, uit Utrecht (for Utrecht, from Utrecht). 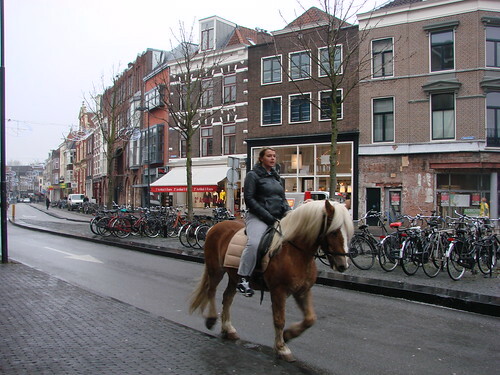 Utca is another way of saying Utrecht, sort of a street version, in the way that Utreg is a dialect version. But don’t take my word for it. I may be too old and too allochtoon. What I do know is that I love their style and plan on getting some of their shirts when I can make up my mind which to get first. U’tje Tattoo, Utca 030 (030 is the Utrecht area code), or the Utca Crest. And then there’s the scarf that is sadly out of stock! Plus there’s all the cool stuff in the brick-and-mortar store on Hardebollenstraat. Choices! It’s located across the street from the mural I posted about yesterday. In fact, you can see the mural reflected in one of the Utca’s Finest windows. 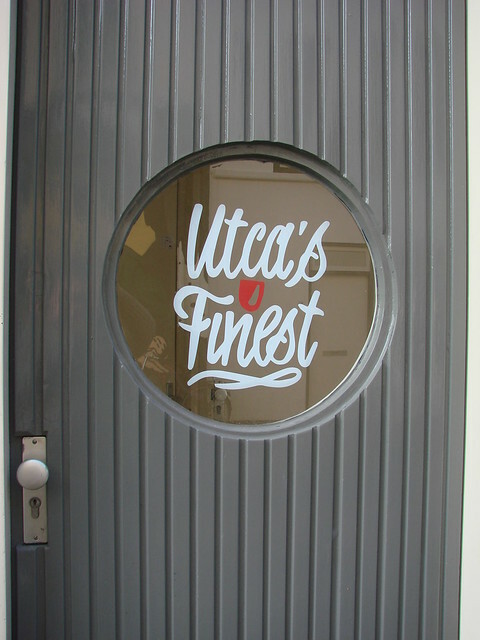 So if you want a special Utrecht gift or just want to wear your Utrecht pride on your shirt/hat/sweater, stop by Utca’s Finest. And if you can’t make up your mind what to get someone, they also have gift certificates so your recipient can be the one to struggle making a choice! Everyone knows about the “coffee shops” in the Netherlands (and yes, it’s not just Amsterdam), where you can purchase various forms of hash, weed, pot, marijuana, etc. Voorstraat/Wittevrouwenstraat have a couple of places where you can purchase, but there are also places in town where you can buy your own paraphernalia, AKA headshops. 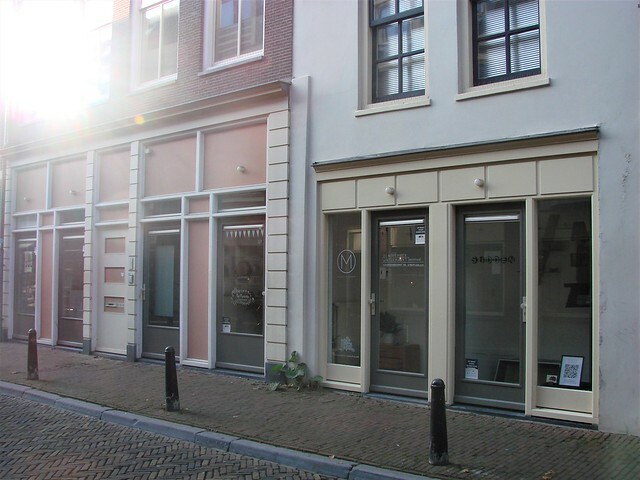 Conveniently, perhaps, Magic Mind is a long-standing one at the corner of Voorstraat and Hardebollenstraat. Hardebollenstraat used to be the inner-city red-light district here in Utrecht, but no longer. It’s now a trendy shopping street with lots of great indie shops. More about that tomorrow. 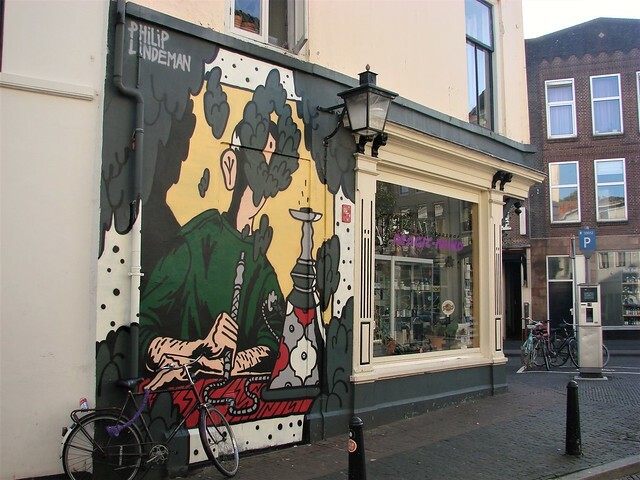 With the new shop fronts on Hardebollenstraat comes a new wall mural. (OK, it’s been there for a few months at this point.) 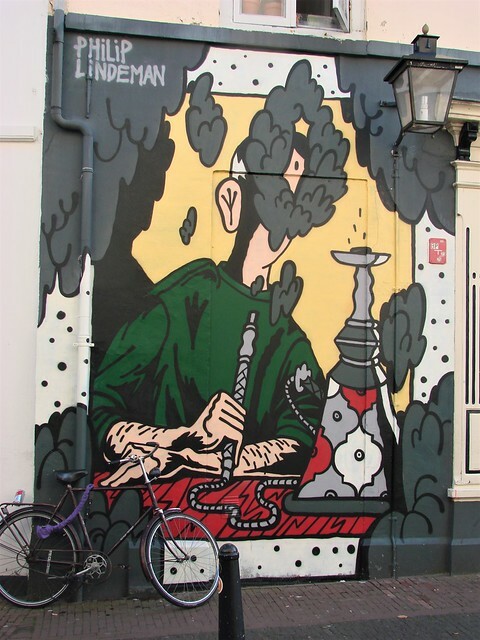 Philip Lindeman, a young graphic artist/illustrator is the artist of this latest wall art to enhance Utrecht. I really like his style and a copy of his book The Cover Art Catalog is on my wishlist. Give the mural a look-see the next time you’re in the neighborhood. Friday I posted a teaser of a photo with a view of Neude square from above. Today, the grand reveal. Thanks to the post I did a couple of weeks ago about the Neudeflat building that is considered an eye-sore by many in Utrecht, someone filled my request to see the view from the top of the building. Herbert, a Twitter acquaintance, happens to work for the city, who own the building. 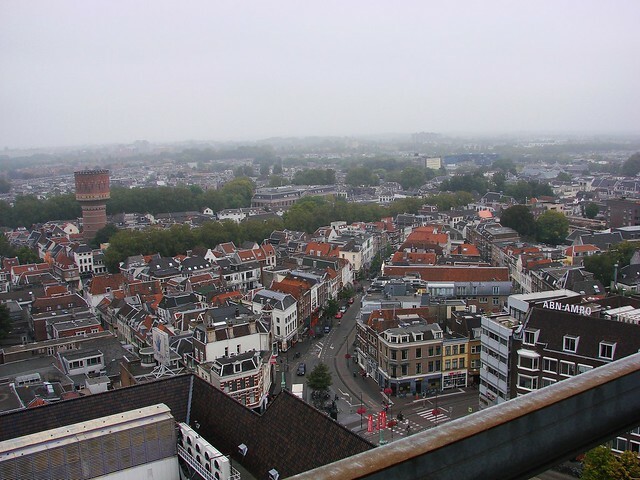 He kindly offered to take me up to the 16th floor to see the grand view of Utrecht from above. The weather had turned a bit foggy, so distance views weren’t great, but the low light worked out well. I really do have a lot of photos, but for today, just a few overviews. I’m thinking up ideas for some of the other photos. 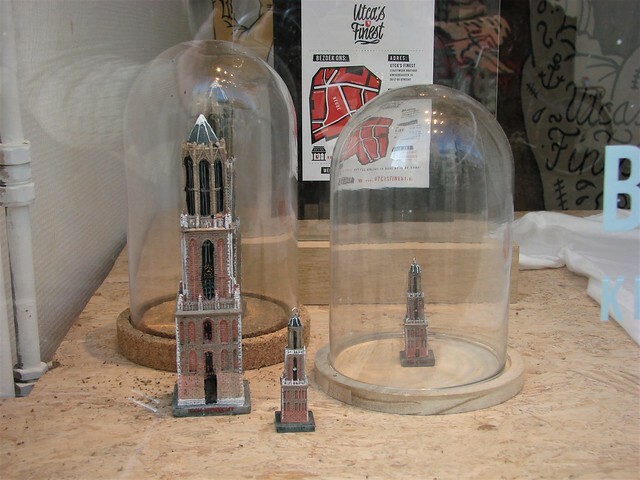 In the first photo, obviously you see the Domtoren and the cathedral, with the Willibrord church on the far left. The building in the middle foreground area with the flags is the stadhuis (city hall) and the Oudegracht canal runs off to the right, though it’s a bit lost amid all the buildings. 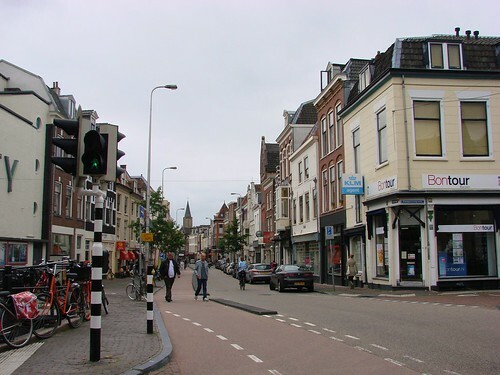 And now, a bit to the northeast, here’s a view of Voorstraat as it leads off from Neude square, and on the left is an old water tower. This is the binnenstad, the old city center, but notice all the trees. It’s an old, urban city, but it’s nice to see bits of greenery, as well. That’s all for now, but you’ll be seeing plenty more in the coming weeks, I’m sure. This is just a quick post to show a bit of then and now and how little has changed in 100 years. This is a view of the Driftbrug, a bridge over the Drift canal. 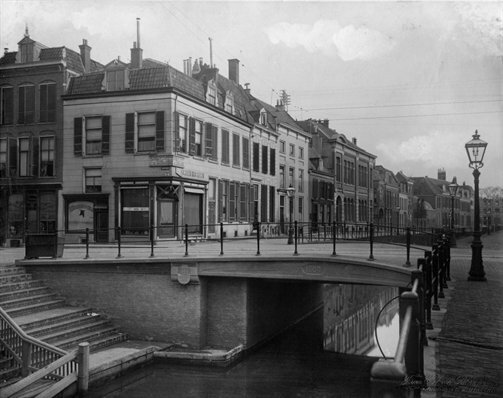 To the right, the street become Wittevrouwenstraat and to the left it becomes Voorstraat. 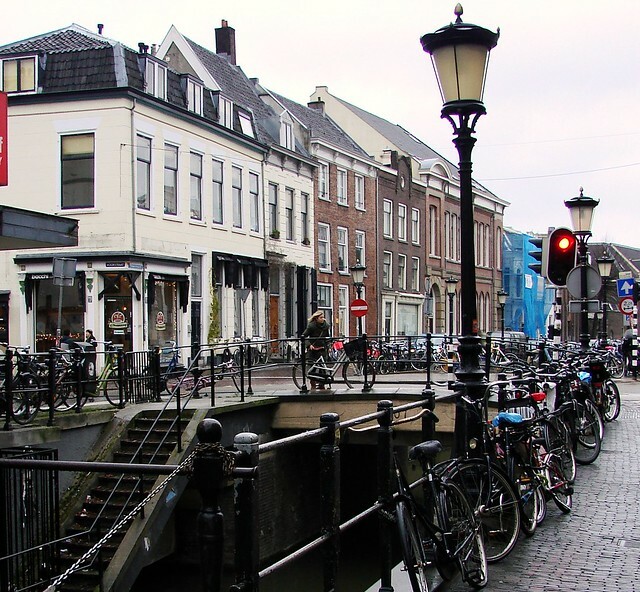 Today, a number of the Utrecht University buildings line the street along the canal where the photo was taken, while expensive homes and various businesses line the canal in the distance. 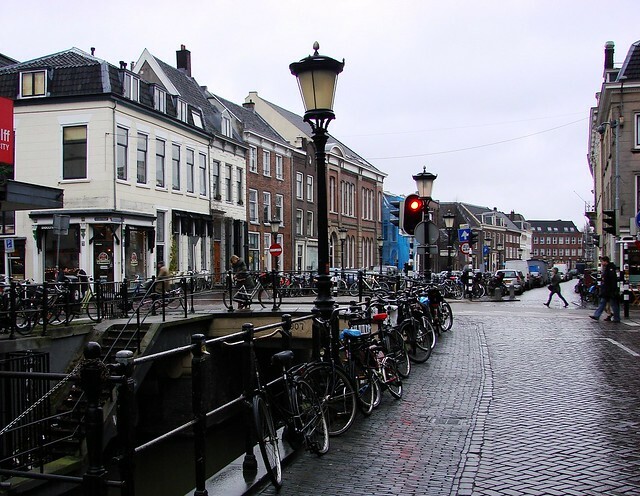 At that point, the canal becomes known as the Plompetorengracht. Although the buildings have changed purpose since this photo was taken in 1908, the majority of them have remained roughly the same. That said, one of the unseen buildings on the left has changed quite a bit, as have the stairs leading down to the canal. It’s all a bit more crowded with signs, traffic lights, and of course, lots and lots of bikes, but it doesn’t take much imagination to see what it was like just over 100 years ago. The sound of horse hooves rang out along the street and heads turned to catch a glimpse. Like me, most of us probably expected to see a pair of police horses patrolling the street. 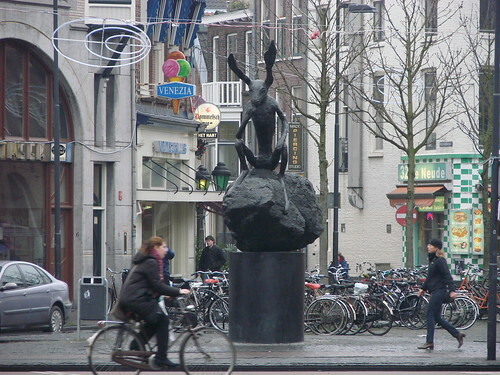 Although not a daily sight, they aren’t completely unheard of, either, and can be seen in various spots throughout the binnenstad (old city center). Suddenly, as we rounded the bend in the street and the cars passed, we realized that today’s equine amblers were a little bit different. 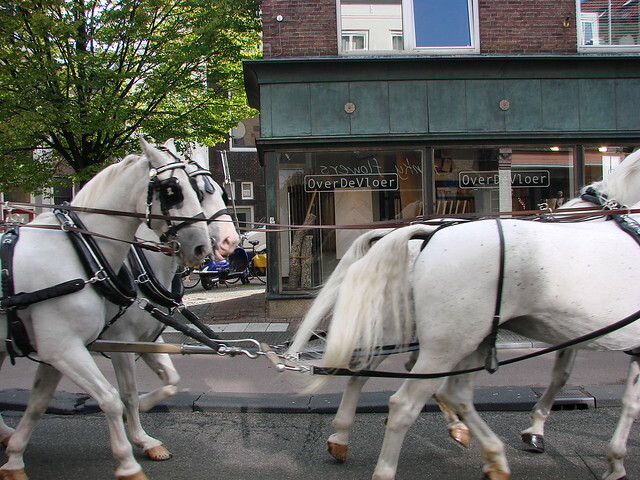 Four white horses suddenly appeared, drawing behind them a storybook carriage. 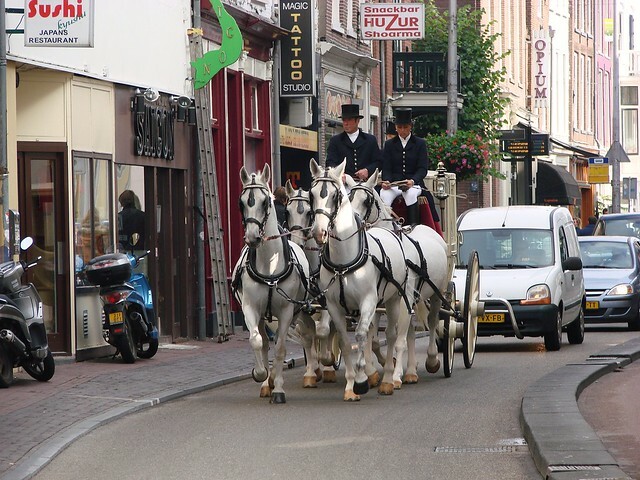 With a line of autos and bicycles forming behind them and signs for sushi, Saigon, shoarma, and tattoos, surrounding them, it really did seem as if a fairytale carriage had been plucked from its story and dropped into the middle of modern Utrecht. The horses moved at speed, unbothered by shifting scenery. The carriage itself was empty. Perhaps this is just the beginning of the fairytale, with the villain magicking away the carriage sent to reunite the story’s amorous pair. 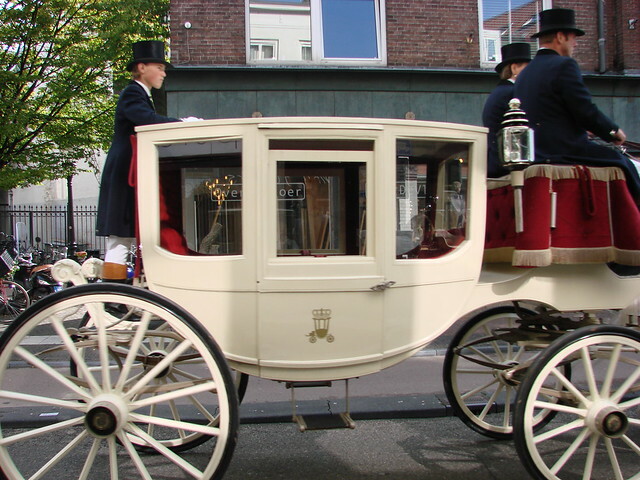 Or perhaps the drivers and footman are our heroes in disguise, magicking themselves away to avoid some rogue character. The end of the story remains a mystery as the horses and carriage soon disappeared from sight. Was a cruel deed victorious or was there a happily ever after? Make of it what you will. There’s a lot going on in Utrecht this weekend. Here are a few highlights of some of the bigger events. 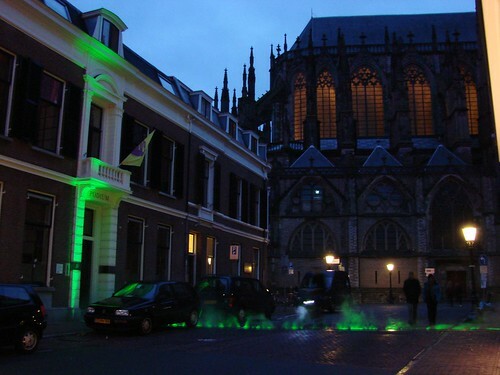 Utrecht is celebrating its 890th birthday tomorrow. 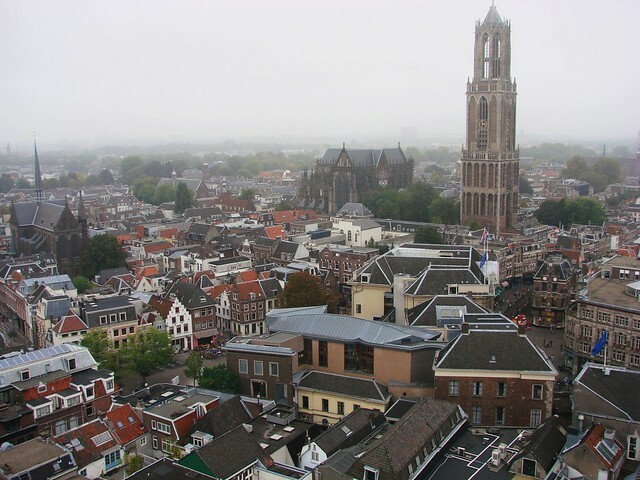 It was 2 June 1122 when keizer Hendrik V (Emperor Henry V) granted official cityhood to Utrecht. Of course, the city has been around in one form or another for much longer. You can see some of the 3D depictions of what part of the city looked like if you click on this link. To celebrate this anniversary, there will be a variety of festivities tomorrow for Stadsdag (City Day). Starting at 10 a.m., there will be tours, special programs and performances and much more. You can see the full program listing on the official website. I’m still trying to work out which events to go to, such as the tour of the Buurkerk clock tower and the Domcarrillion concert. There’s also a lot of stuff going on at the Utrechts Archief (archives), so hopefully the weather will cooperate! 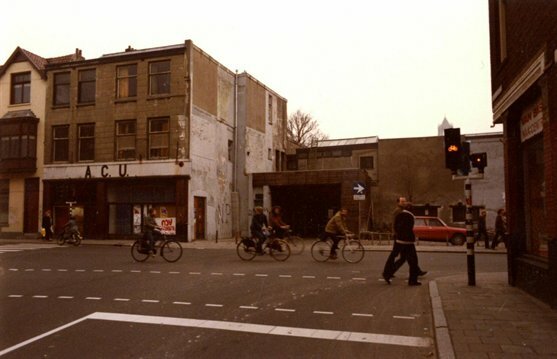 To go along with the look back at Utrecht in the past, you might want to check out this documentary that the RTV Utrecht channel aired recently. Even if you can’t understand the Dutch, you might be interested in seeing video of the Domplein area, which I post frequently, including in both of these photos. 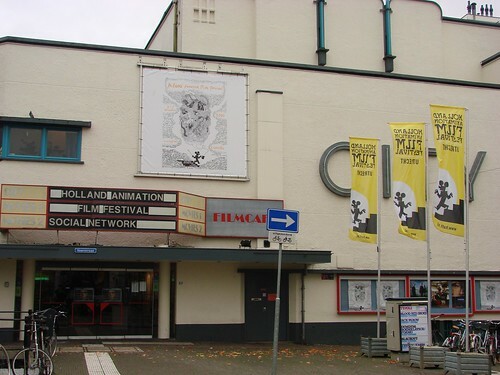 On Sunday, it’s time for another Culturele Zondag (Cultural Sunday). This month’s theme is dance, with all sorts of dance styles being represented by professionals and amateurs alike. Throughout the city, there will be performances in shops, museums, theaters, and even on the street. 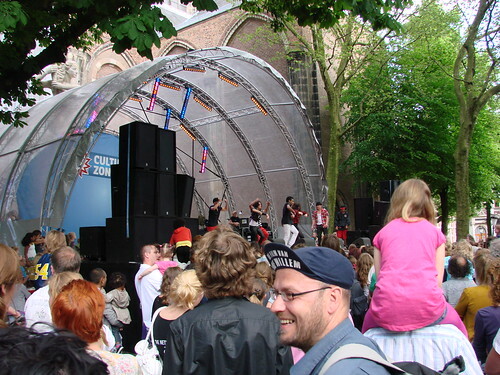 In fact, Voorstraat will be the site of a street festival, with dancing, live music, DJs, and special tours. Finally, on Sunday, there’s also the latest edition of De Streekmarkt on Twijnstraat. This outdoor market features some of the best of organic and local food items. The next one isn’t held until September, so you might want to be sure to check it out this month to see what special summer items are on hand. 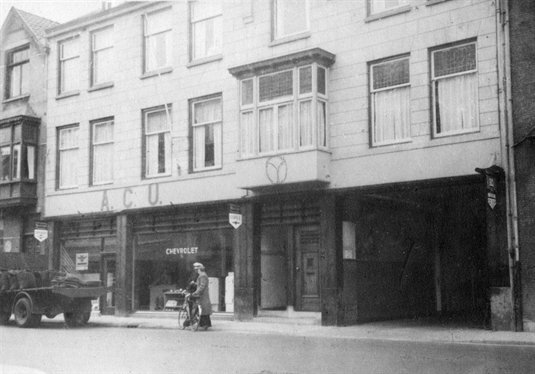 The blue and white facade of the ACU building on Voorstraat belies a storied and interesting history. The buildings, originally 71 and 73, began as municipal horse stables. Then, in the 1920s and the meaning of horsepower changed, an auto garage took over the property. 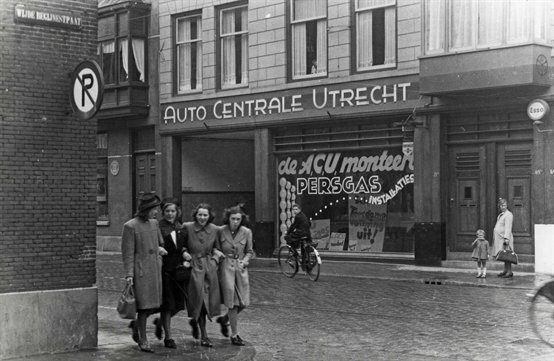 By 1935, the Maas family took over the property and changed the name to Auto Centrale Utrecht (ACU). The following are photos of the building from 1943 and 1950, respectively. Somewhere along the way, the right half of the building was demolished, but I’m not sure when that happened. I do know that by the early 1960s, the garage closed its doors as a business and the property was left empty and abandoned. This is where things start to get particularly interesting. 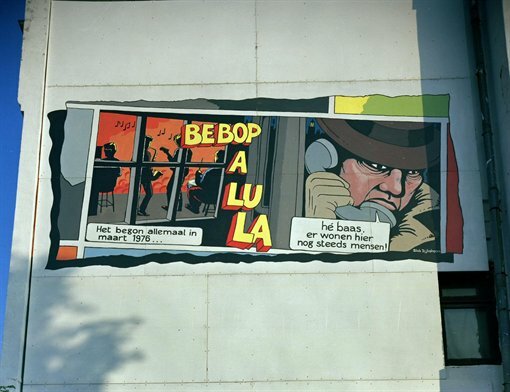 Under the cover of darkness on March 26/27, 1976, the buildings making up Voorstraat 69, 71, and 73 were squatted. Squatting and squatters (kraken), are probably thought of slightly differently in the US versus much of the rest of the world. In many countries, it’s a result of true need. For others, it’s a political or social statement. In the US, it’s almost always considered illegal and is usually associated with the homeless, gangs, drug addicts and criminals. Meanwhile, in many other countries, squatting has been legalized to one degree or another, or at least a certain truce has been reached. 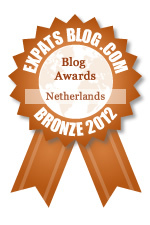 That was the case in the Netherlands until October of this past year when the Squatting Ban Bill was passed. Squatting really gained momentum as a movement in the Netherlands in the 1960s, as a form of protest. There was a housing shortage (don’t forget that the Netherlands has the highest population density of any country in Europe) and property owners were intentionally leaving buildings empty to drive up market prices. Thus, squatting became, in this case, a political anti-speculation move. Eventually, in 1971, the Dutch Supreme Court ruled that squatting was legal under the concept of huisvrede (domestic peace). As a rule, as long as a building had been empty for at least 12 months and the owner was not going to be doing anything with it in the next month, squatting was legal. The reality is that many buildings taken over by squatters have benefited from their new inhabitors. Of course, there are always going to be bad eggs in the bunch, but many buildings have been improved and offered something for the community as well as the people living in them. Not all buildings squatted become residences only. 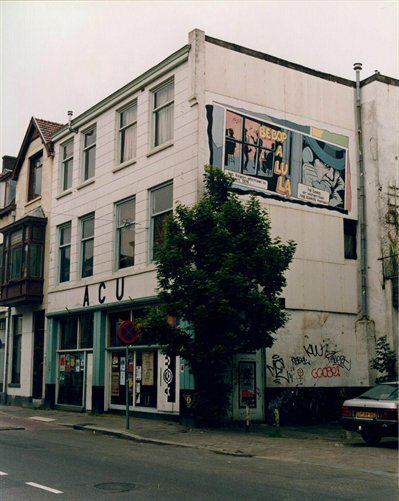 In the case of the ACU building, the squatters also turned the building into a bar (opened in 1983) and cinema club, as well as a place for music performances, dance nights, a food co-op, and squatting consultancy. The ACU still serves these purposes and more today. Still, by 1993, the owner of the building had decided to sell it and the squatters were facing a decision. Ultimately, the users and inhabitants decided to try to purchase the building and make the whole thing legal. 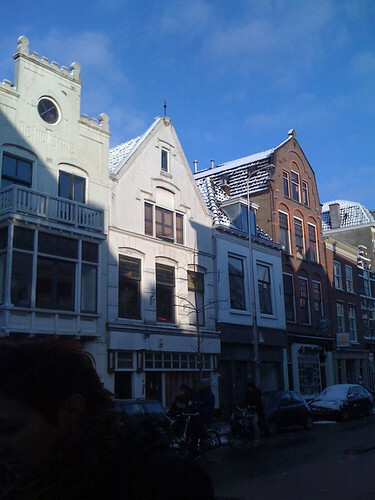 After forming the Stichting Voorstaete (Voorstaete Foundation), and after much negotiating, the buildings on Voorstraat were purchased, along with another squatted building around the corner on Boothstraat. 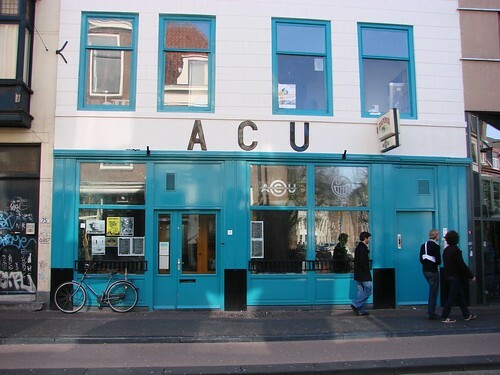 The buildings on Voorstraat were renovated, and by 1999, the political culture center that is the ACU was complete. 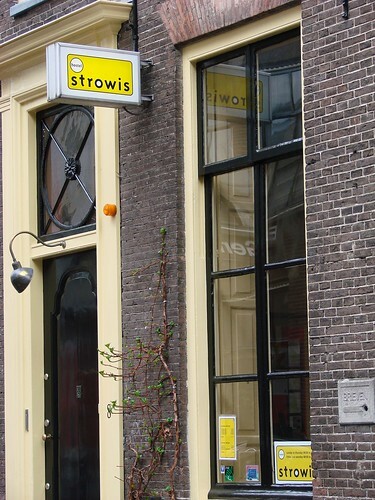 The building on Boothstraat is now the home of Strowis, a low-budget but attractive hostel perfectly located in the center of the city. I suspect that will be the case for many buildings that are squatted, squatting ban bill be damned. As I said, it’s not all positive, but it’s not all negative either. I’ve heard stories that go both ways. It seems like a case-by-case situation, and as a result, I’m not sure that the ban was the right approach to take. Regardless, I’ve enjoyed getting to know a bit more about a building I pass regularly. Voorstraat is one of those streets that you can’t help but spend a lot of time on if you live in the north/eastern part of the city center. It’s got a variety of stores and services, and is an easy way to get from one part of town to another, since it ends up at Neude square, which can then take you to numerous other spots. If you look at the buildings themselves, they really haven’t changed much, although the ground level businesses have changed. The biggest difference is the front left corner. 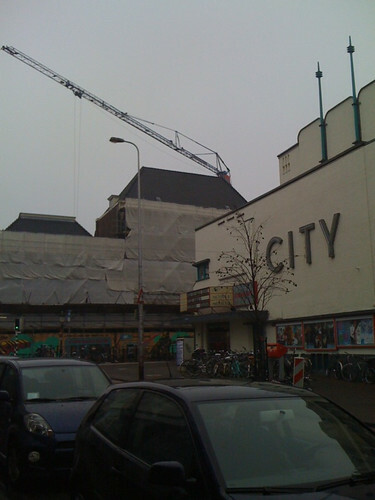 The old building has been replaced by the City Movie Theater. The only other difference, outside of the absence of tram tracks and the appearance of cars is the church steeple in the far distance. In the old photo, it’s simple rectangular. In the new photo, there’s a pointed steeple on top. What I can’t tell is if the steeple was simple under repair or if it hadn’t been added yet. Not knowing when the old photo was taken, I must say it looks more as if the steeple is simply covered in protective scaffolding. I’m sure Voorstraat was probably just as useful last century as it is now. Nowadays, besides being home to two grocery stores, Plus and Albert Heijn, it’s also home to Plato Record Store, Tattoo Magic Store, travel agency offices, a Chinese massage/reflexology sort of place, hairdressers, a sewing supplies shop, multiple coffee shops (of the cannabis variety), Taco Mundo, multiple vintage clothing stores, along with higher-end clothing stores, a used/antique book store, a florist, an organic grocer, formal wear shops, clothing repair stores, a shoe repair shop, a locksmith, fancy furniture and lighting stores, along with numerous restaurants and cafés, with many new places opening regularly. It’s not always the prettiest street, but for daily life, it covers a lot of bases. And there are pockets of grace and whimsy along the street. There’s even the occasional horse. And don’t forget the rabbit! 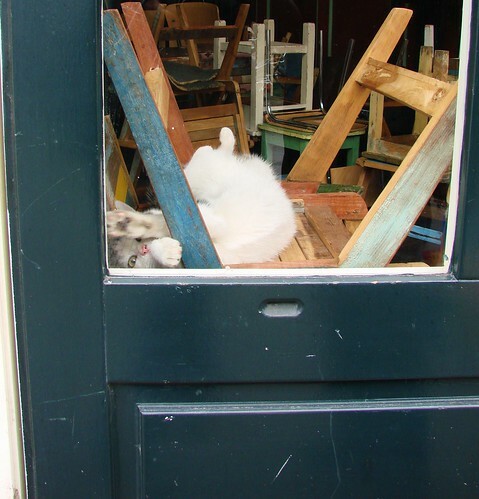 We were walking along Voorstraat this afternoon and saw this adorable cat taking a nap in one of the restaurants. It’s not uncommon here to find cats in restaurants, presumably as insurance against any unwanted rodents. 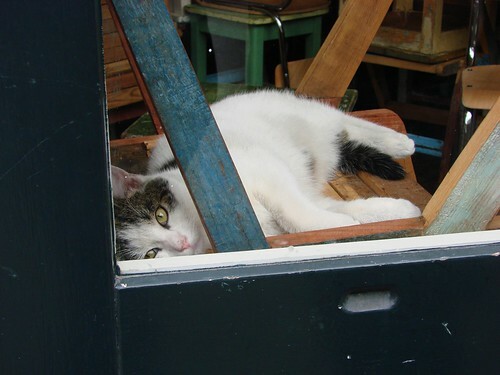 There’s been a book published about the store cats of Utrecht. I need to remember to put that on my wishlist. 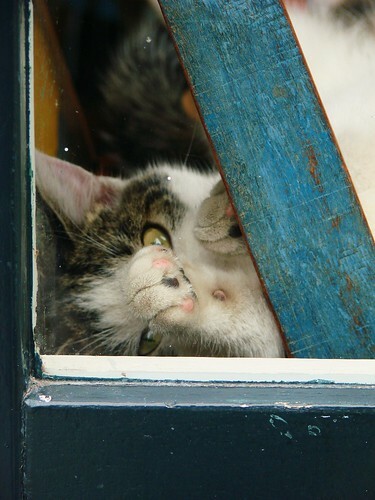 I’m afraid we woke this kitty from her nap, as we stopped to admire her. She didn’t get up, but did seem to get a nice stretch in as we oooed and awwwed over her. Such cute little paws!